This deck depicts sugar skulls in various forms. The Court Cards depict the skulls with musical instruments, hats and flowers. The Jokers take a similar approach, although with a character all their own. 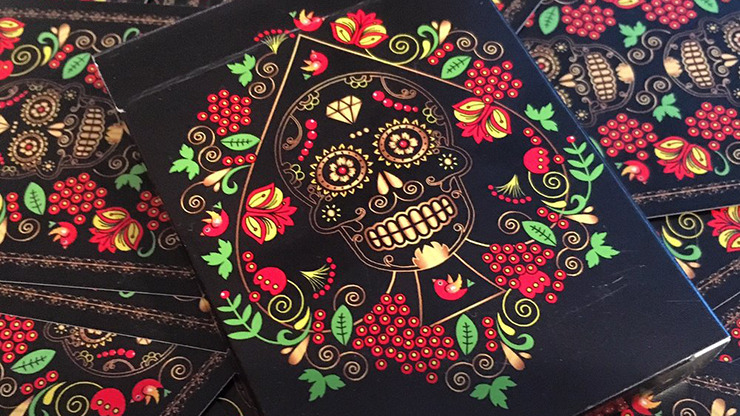 Amazing skull designs are depicted on the card backs and on the case. The credentials of Russian graphic designer Natalia Silva are impressive, with a resume that includes a Bachelor in Finance, a Master of Fine Arts in Advertising/Art Direction, a decade of experience as a freelance art director and graphic designer, and an extensive portfolio. Fortunately for us, her design work includes playing cards. After her successful Russian Folk Art designs, Natalia wanted to explore another culture and tradition: The Mexican holiday Día de los Muertos, the Day of the Dead. This event is celebrated annually at the start of November, and features an unusual juxtaposition between the festive and the macabre. Typical motifs include skulls decorated with bright and vibrant colours. Natalia turned to this material as her inspiration, the colourful sugar skull associated with this holiday and the vibrancy of Mexican culture being a good fit for her style. 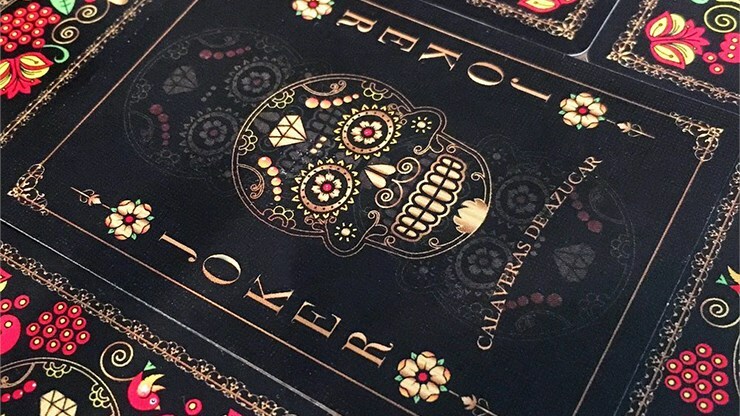 The Calaveras de Azucar deck was produced in a black deck as well as blue. It is named after the tasty confectionery available just for the holiday: sugar skulls, called calaveras de azúcar. 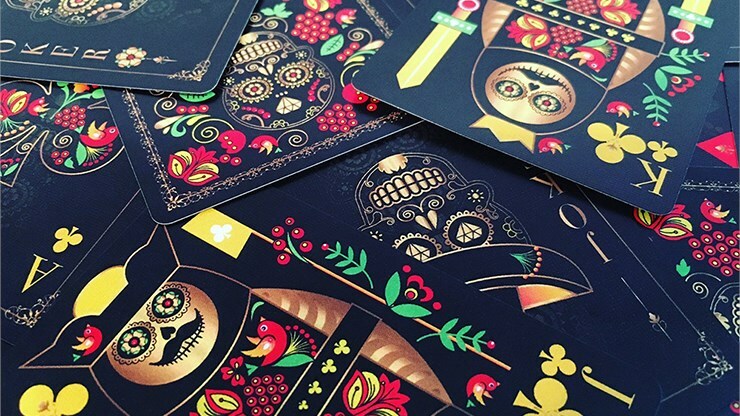 The overall colour scheme of the cards in the Black deck is reminiscent of Natalia's limited edition Folk Art deck, which also relied on a black background with red and gold colours dominating. Like that Folk Art deck, the card backs here also have berries and leaves, but are now black bordered instead of white bordered, which arguably works even better to match the entirely black canvas of the card faces. The blue Calaveras deck features a slightly altered colour scheme, with the strong presence of flowers instead of skulls as a watermarked background. The blue and gold colours make for a beautiful combination, especially with the court cards. The number cards in this deck also look lush, colourful, and ornate - although with the blue deck the spades and clubs rely just on the shape of the pips, and don't appear in full yellow. Despite the macabre subject material, the effect of the vibrant colours and lively designs is remarkably positive and upbeat. 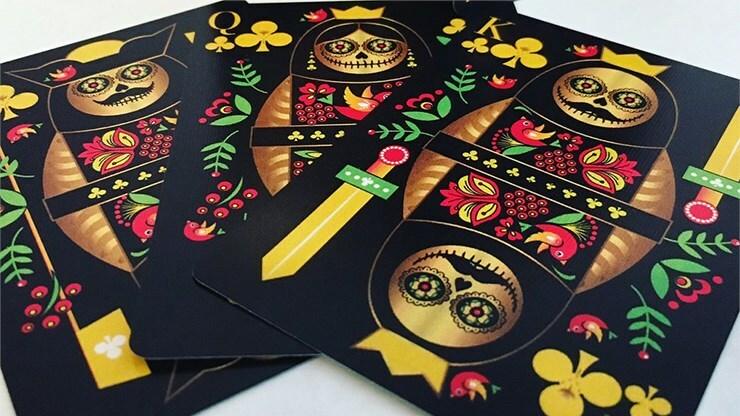 The style of the court cards is reminiscent of the Russian nesting doll inspired courts from the folk art deck, and are filled with rich symbols and motifs from top to bottom. The number cards are fully custom and ornately decorated, and even the Jokers contribute positively to a sense of liveliness and energy. Who would ever imagine that so much life and colour could accompany a grinning spectre? These decks will find a welcome home for collectors, or anyone who appreciates art and cultures.